An on-screen graphic displayed the description during a segment about attacks on the wife of the presumptive Democratic nominee. An alert reader wrote in just a little while ago to let us know about something he'd spotted on Fox News Wednesday afternoon. 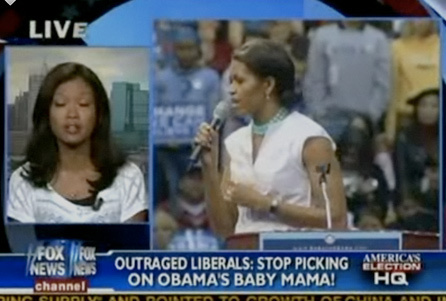 During a segment discussing conservative attacks against Michelle Obama, the wife of presumptive Democratic nominee Barack Obama, the network described the former as "Obama's baby mama." I checked, and sure enough, as you can see below, our e-mailer was right. In fact, that description was displayed on-screen several times during the segment, which featured anchor Megyn Kelly and conservative blogger Michelle Malkin, an FNC contributor. A clip of the segment in its entirety is below. You may notice that at one point, Malkin says, "By the way, it's not just Republicans who are criticizing some of her comments, but also statements have been made in the left-leaning blog Salon about her comments." I've searched the site, and I can't find anything like what Malkin is talking about. I've e-mailed Malkin asking for clarification -- if and when she responds, I'll update this post. Update: Malkin responded to my e-mail; she says she misspoke and that she meant to refer to Slate, not Salon.